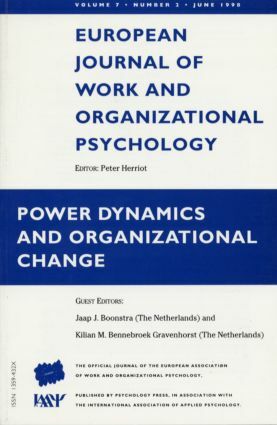 This special issue of the European Journal of Work and Organizational Psychology is about power dynamics and organizational change. In this issue theoretical models, research findings and practical experiences are presented to examine power processes, decision making, influence tactics, resistance to change, management of change, and effects of change processes in organizations. The issue starts by discussing different perspectives on power and organizational change. Eight contributions from six countries address a variety of issues. J.J. Boonstra, K.M. Bennebroek Gravenhorst, Power Dynamics and Organizational Change: A Comparison of Perspectives. P. Bradshaw, Power as Dynamic Tension and Its Implications for Radical Organizational Change. B.J.M. Emans, M.J.J. van Tuuren, Restructuring Welfare Organizations: The Power and Powerlessness of Local Authorities. L. Munduate, M.A. Dorado, Supervisor Power Bases, Co-operative Behaviour, and Organizational Commitment. K.M. Bennebroek Gravenhorst, J.J. Boonstra, The Use of Influence Tactics in Constructive Change Processes. A. Pettigrew, T. McNulty, Sources and Uses of Power in the Boardroom. F. Pichault, A Political Model of Change in Network Organizations. J. Landau, Short-lived Innovation: Participation and Symmetrical Relationships. J. Toplis, Professional News Section.